The plastics industry manufactures polymer materials and offers services in plastics important to a range of industries, including aerospace, building and construction, electronics, packaging and tranportation. 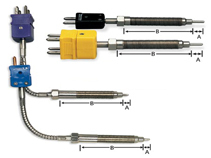 Thermometrics offers a variety of explosion proof sensors assemblies. Many of our sensors are available with the protection of a thermowell. The majority of our sensor assemblies had the ability to accommodate connection heads and transmitters. This is a "melt bolt" sensor. The melt bolt sensor illustrated to the right is used on extruders and injection molding machines to directly measure the melt temperature of plastic as it moves down the extruder barrel.